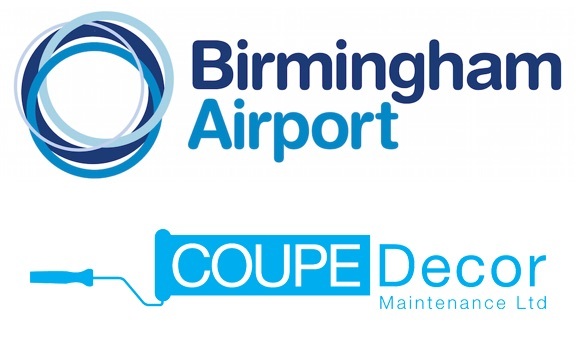 Birmingham Airport were undergoing renovations to improve their customers’ experience. 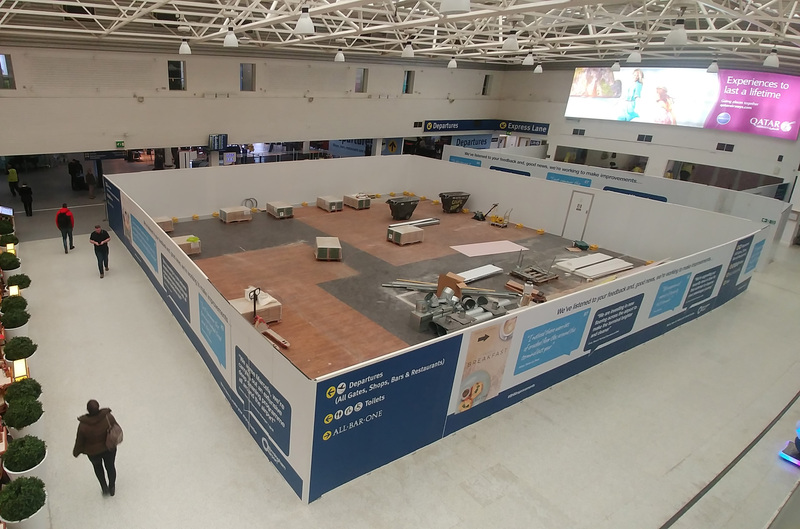 Contractor Coupe Decor were tasked with removing the restaurant and seating areas to create a new and improved entrance into the airport security hall. 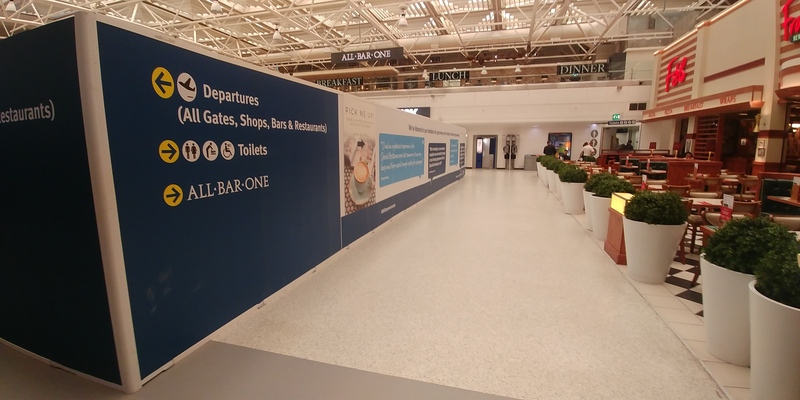 Westgate were approached to provide internal site hoarding to shield the ongoing renovations from customers as the airport remained fully open whilst the project was underway. Westgate provided 2.7m high Hoardfast PVC panels with weighted supports to assist with the project. Directional signage and improvement feedback graphics were applied to the exterior of the hoarding to create a simple and smart looking system which enhanced the passenger experience and seamlessly fits into the environment. Customers eating in the restaurant opposite were unaware of work taking place behind the hoarding. In total 100m of hoarding was used (with offset supports using one weight placed every 1m) which the contractor purchased to enable them to use it multiple times. Hoardfast PVC is designed to be reusable and as such Westgate offer panels on a hire term with the option to also purchase. Single door contractor access with a push keypad for additional security was also required. One of the many benefits of the Hoardfast PVC panels is the clean usable surface ideal for advertisements and passenger messages, which helps to reduce the disruption for customers and provides a consistent corporate image over multi- project rollouts. The tongue and groove panels which slot together easily to facilitate a simple, fast, clean installation and dismantling process. To reduce disruption further, our steel faced Hoardfast Soundscreen panel option is available which helps to reduce noise from building works. Hoardfast Firescreen (offers 60 minute fire resistance) and Flamescreen (surface spread of flame and fire propagation) panels are also available. 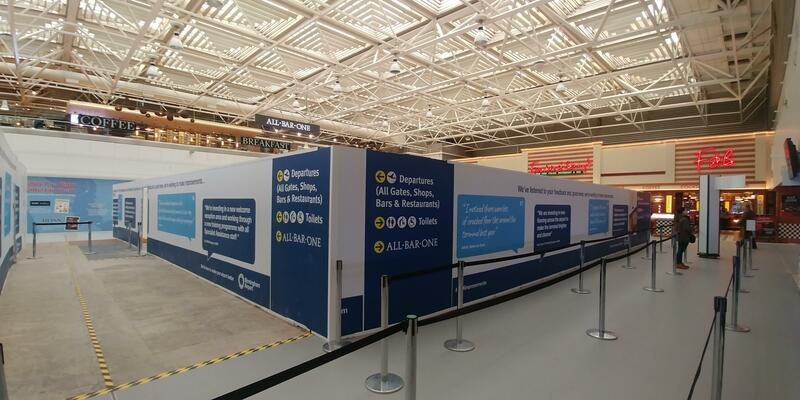 Westgate’s high grade hoarding system is designed and proven to perform in airports. It has been supplied and installed at many of the major airports across the UK including Heathrow and Gatwick. There are various stability options available to assist with weight loading depending on the location within the airport. Depending on location, high movement and usage areas, Westgate can help work out the amount of weights needed to comply with impact loading regulations. Westgate’s Hoardfast sustainable promise makes it the ideal product for use in airports. Hoardfast PVC panels are manufactured from 85% recycled plastics. You can find out more about Westgate’s sustainable promise here.